Authors, American - 19th century - Biography - Juvenile literature. Nineteenth-century America and the world of Samuel L. Clemens, better known as Mark Twain, come to life as children journey back in time with this history- and literature-laden activity book. The comprehensive biographical information explores Mark Twain as a multi-talented man of his times, from his childhood in the rough-and-tumble West of Missouri to his many careers-steamboat pilot, printer, miner, inventor, world traveler, businessman, lecturer, newspaper reporter, and most important, author-and how these experiences influenced his writing. Twain-inspired activities include making printer's type, building a model paddlewheel boat, unmasking a hoax, inventing new words, cooking cornpone, planning a newspaper, observing people, and writing maxims. 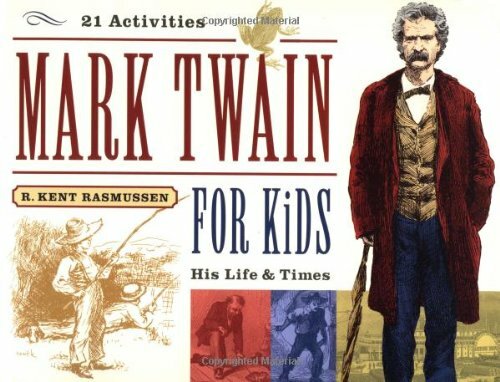 An extensive resource section offers information on Twain's classics, such as Tom Sawyer and The Adventures of Huckleberry Finn, as well as a listing of recommended web sites to explore.